The Air Jordan Retro 11 finally launches on May 3rd 2014. Release details and links below. The Air Jordan Retro 11 Concord Low has been long rumored since Jordan was seen wearing them in the Bulls 1996 Championship parade. They weren’t seen again until 2011 when he was caught rocking a pair, but still none for the fans. 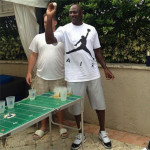 Late in 2013, someone snapped a photo of the GOAT playing beer pong in a pair and by then we were pretty sure they’d drop soon. 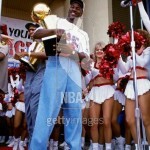 Jordan, the envy of every sneakerhead rocking the Concord Low 3 years prior to their release in 2011. Finally they’re here! The Air Jordan Retro 11 Concord Low will release May 3rd online and in stores. Foot Locker will hold the usual lottery. Tickets will be given out for the Retro 11 Concord Low Wednesday 4/30 and Thursday 5/1. Winners will have a pair held for them at a local Foot Locker or House Of Hoops. On 5/3 Nike will release them online and in Niketown stores. The Retro 11 Concord Low release will be delayed until 10 AM EDT presumably to alleviate the server strain they experienced with the Nightshade Low release. This will also give people on the west coast a better chance to cop a pair. A 3 AM early launch is likely for UK retailer END. You can also expect a 7 AM release for CrookedTongues and Urban Industry. Finish Line, Jimmy Jazz and Foot Locker sites will release them online at the usual 8 AM EDT. Cop These Kicks will be posting early links throughout the week to help you get the drop on the cop.